In Hanoi, Vietnam, there is a lake in the center of town that maintains special significance to the Vietnamese people. In the middle of that lake is a tiny island that holds a tower which commemorates the important victory achieved by a Vietnamese legend. Turtle Tower, known to the Vietnamese people at Thap Ruá, was built in 1886 on the same site where a Ta Vong Temple had been built during the 17th or 18th century. Somewhere between the Restored Le Dynasty and the Nguyen Dynasty that temple disappeared. The tower that stands there now was erected on the same site to commemorate a warrior and the impact he had on Vietnam. According to legend, a warrior named Le Loi was born in 1384 to an aristocratic family from Lam Son, Thanh Hoa province. When he became of age, Le Loi followed in his father’s footsteps to become a landowner and administrator in the region where he was born. As he grew up, Le Loi witnessed many atrocities against the Vietnamese people by the Ming Chinese who occupied Vietnam. He became angry at the unjust hardships placed on his people and in 1407 he witnessed the Ming Chinese destroy an entire Vietnamese village. This was the final outrage. Le Loi vowed that one day lead his people to freedom from the Chinese invaders. While Le Loi’s desire to free his country was strong, it took time before he was able to begin working towards that goal. It wasn’t until 1418 that Le Loi began his crusade to rid Vietnam of the Chinese. The day after Tet, which is the Vietnamese New Year, Le Loi’s family moved into the hills above where his family had lived for generations and began recruiting people to their cause. From there he rallied his people and inspired them to fight for their freedom. Starting out with 500 fighters, he organized them into groups to undermine the morale of the Chinese in any way they could. Under his leadership and with his strong determination to free his country, Le Loi led his people through a long and difficult struggle for freedom. The fighting lasted for many years and in 1425, almost all of Vietnam was involved in the struggle to oust the Chinese. With their vast numbers, the Vietnamese people had much success and were to a point where they had almost destroyed the occupying Chinese forces. In an ill-advised move, the newly instated Ming Emperor followed the advice of his advisers, against his own personal desires, and sent an additional 100,000 troops to Vietnam in an effort to crush the rebellion once and for all. The advisers had miscalculated the number of Vietnamese people willing to fight for their freedom and misunderstood the strength of their resolve. There were 350,000 Vietnamese troops waiting for the Ming Emperor’s battalion when it arrived. The Vietnamese also employed psychological warfare against the Chinese in order to break their spirits before having to face them in battle. In 1426, the battle to decide the outcome of the rebellion took place at Tot Dong. The Vietnamese were successful in capturing and executing the Chinese General, Liu Shan before luring the remaining Chinese forces into Hanoi where a trap had been placed for them. The Chinese entered the village and the Vietnamese used their larger force to surround and slaughter an estimated 70,000 soldiers from the Chinese army. Paramount in this victory for the Vietnamese was Le Loi and the use of a mystical sword he received from the Dragon King in his underwater palace. A fisherman caught the blade of the sword in his net and Le Loi found the hilt for the sword in a banyan tree. Legend says that the sword was inscribed with the words Thuan Thien, which means The Will of Heaven. This sword was said to have endowed Le Loi with great power and strength as well as increasing his physical stature when he used it. The strength and power Le Loi received from the sword allowed him to rally his troops and secure the victory that freed Vietnam from Chinese oppression. Shortly after Le Loi’s victory comes the second half of the legend which gives the lake its name. The lake is named Hoan Kiem Lake, Lake of the Returned Sword, because it is that lake where the Dragon King reclaimed the sword he had given Le Loi to free the Vietnamese people. Shortly after the Chinese recognized Vietnam as independent from them, Le Loi took a boat ride out on Luc Thuy, Green Water Lake. While sitting in his boat with his sword attached to his belt, a turtle came up out of the water and removed the sword from Le Loi’s belt. Carrying the sword, which was now glowing, in his mouth, the turtle then swam down into the lake, never to be seen again. Though he had many men search the lake, Le Loi was unable to discover the whereabouts of either. He then determined that the Kim Quy (Golden Turtle) had been an emissary from the Dragon King to retrieve his sword and renamed the lake Hoan Kiem Lake: The Lake of the Returned Sword. Years later, in 1886, while Vietnam was occupied by the French, a musician who was secretly working for the French received permission from the government to build a tower in the middle of Hoan Kiem Lake in memoriam of Le Loi and what he did for Vietnam. What he didn’t tell the government was that he secretly planned to bury his father there. Residents of the city soon discovered his designs, though, and removed the his father’s body from the structure. This tower, though not built in any type of Vietnamese style and built by someone later discovered to be a traitor, still stands in honor of what Le Loi did for the nation and also for the magical turtle that is standing guard over the sword Le Loi used to free his people. 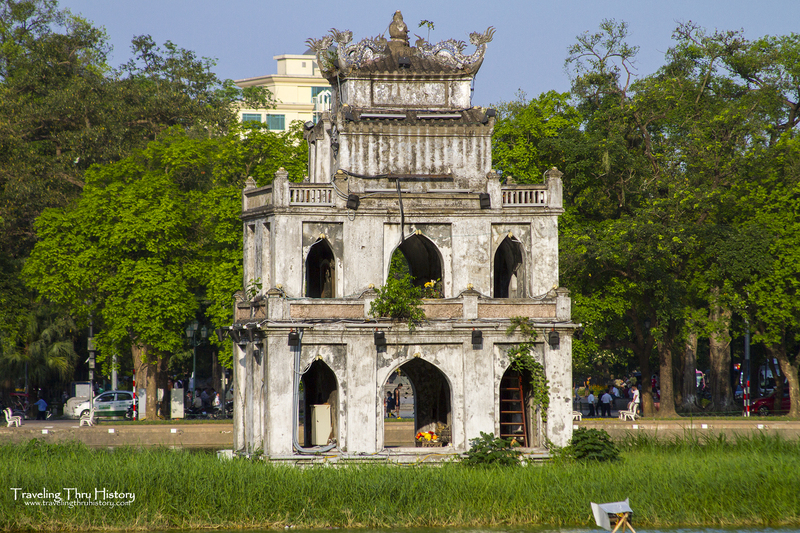 This tower has stood for almost 150 years as a symbol of patriotic pride for the people of Hanoi. Though the French placed their own ‘Statue of Liberty’ atop the tower for a time (it was later removed in 1945 when the Tran Trong Kim government regained control of the city from the French), the Vietnamese have always seen this tower as a symbol of the patriotism and unity of the Vietnamese people. Many times during the French occupation, Vietnamese people would hang the revolutionary flag of Vietnam from the top of the tower in defiance of French rule and as a reminder of what the people could do. Today, the tower has a much more peaceful life. It has been decades since there has been a need to remind the Vietnamese people to rise up and fight against invaders. Rarely do people go out to the little island anymore, giving the aquatic residents of that island peace and freedom to roam around as they will. 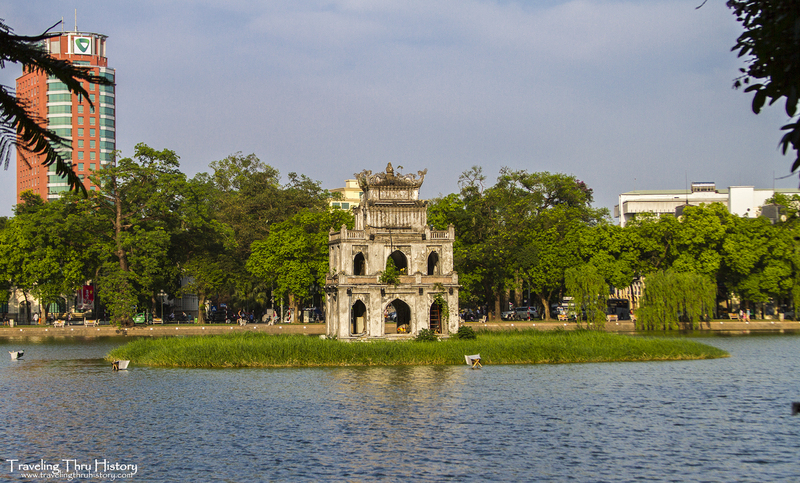 While people may not frequent the sacred spot as often as they used to, this tower still hold special meaning to the people of Hanoi and the turtles who live in the lake still bask in the sun and enjoy the solitude they now receive on the island that houses their very own Turtle Tower. Wow! I love learning a bit more about the history. Thanks for sharing! I love learning new things like this! I majored in history in college and don’t get much of a chance to learn new things like this much anymore. Such a rich history! Thank you for sharing! The history behind this is so interesting. Thanks for sharing! The tower and the story are beautiful–myths and legends such as this one add such a flavor and richness to any travel experience! What a neat story along with the pretty tower. What a great place to visit. I would love to visit Vietnam one day! I bet knowing the history made the visit much more significant. This looks so cool! I’d like to visit Vietnam one day. This looks like a awesome place. I don’t know much about Vietnam, but it looks much different than I envisioned. Thank you for sharing. It looks lovely!! What an interesting piece of history, a lovely place. Oh my goodness, what a beautiful place! Thank you for sharing! The tower is beautiful. My grandmother’s family lives in Vietnam and I see photos all the time from her trips over there. Wow this is great ,what gorgeous photographs. I would love to travel and visit places like this. The history and beautiful sights alone would have me in awe. That looks like a super cool place to do a photo shoot. 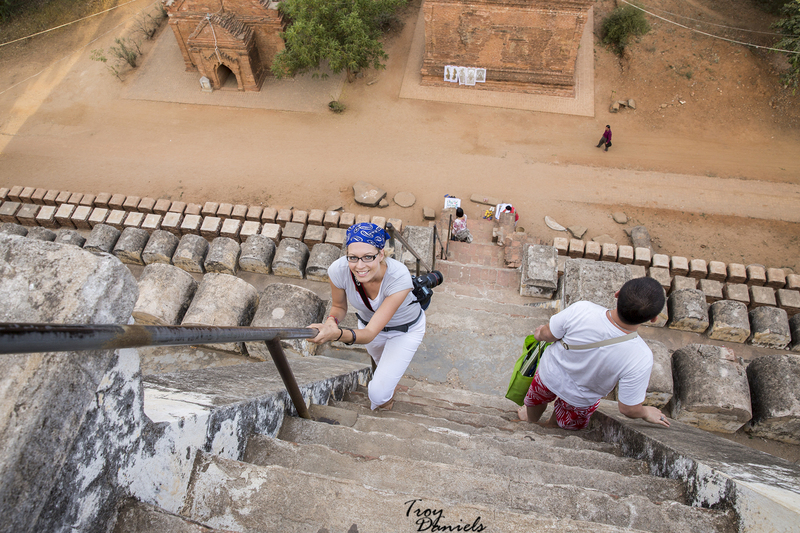 I love reading posts where people dive into the history of the places they visit! I really enjoyed this. I can’t wait to visit Vietnam. It’s wonderful you took the time to learn this history and appreciate more of what you saw while visiting. My favorite way to travel! Wow, that is an amazing history. I really enjoyed reading it. So many interesting historical events that you often don’t hear about. What a fascinating post! I think too often we think only of the events of a place (like the Vietnam war), and forget that there is an entire culture with interesting people and historical events far removed from negative stereotypes. I love this area of Hanoi and the story that goes with that tower. Thank you for reminding me about it and all the history of that great country that is Vietnam! The legend of the turtle and the sword is great too, we saw it depicted a few times in the local theatres in Hanoi and it was beautiful!